So far this year, I’ve saved a considerable amount of money by biking to work, more than enough to pay for the bike and even a few upgrades. Money wasn’t my main motivation (though quite frankly, I’m just surprised at how quickly it added up). Rather, I was frustrated with the constant service changes and delays on my train line that left my mobility to the whims of the powerful and unappeasable subway gods. Also, my new full-time status at Pratt made biking an attractive option since it is actually faster than the subway. Of course, as an environmentalist, I’m also interested in experimenting in lower-carbon lifestyles. Public transportation certainly trumps private automobiles, but the NYC DOT has seen the number of bikers increase 126% between 2007 and 2014. More bikers in the city means more bike-friendly infrastructure, which means biking becomes a more attractive alternative, and so on. Brooklyn immediately shrinks once you hop on a bike. I love visiting new areas. We even made it to Rockaway Beach a few times this summer, which is a pleasantly flat 60 minute ride. It’s significantly less crowded than Coney Island or Brighton Beach. I thought I’d reflect on the privileges that allow me to have this experience, and to note some challenges that I’ve noticed bikers face. The sweet part of my route. First the privileges. I’m able-bodied and can fairly easily bike the 25-30 minutes between work and home. I live in New York City and can take advantage of its compressed space. Over time I was able to shift my route from the shortest to the safest. 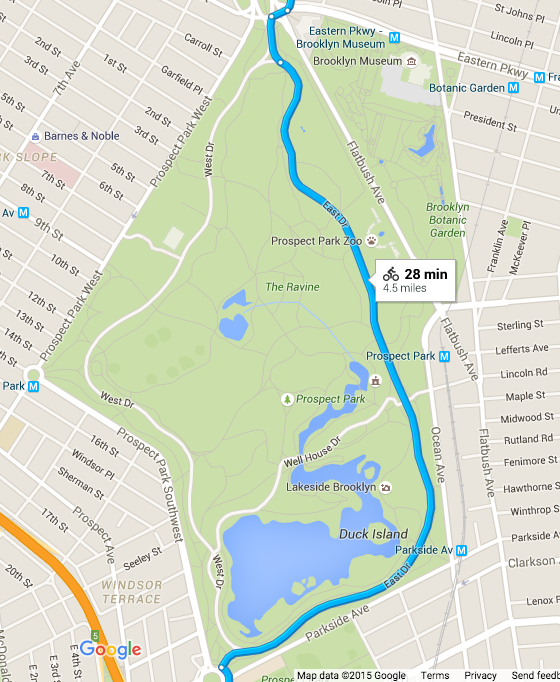 This means that most of my commute time is spent riding through Prospect Park (a great way to start the day). Finally, I have a secure place to store my bike at work and colleagues who are encouraging about my biking. Many of them also bike in. Without any one of these advantages, riding to work would have been much more difficult. Here are the challenges in no particular order. I think these are important to keep in mind if the city wants to encourage more people to use bikes. 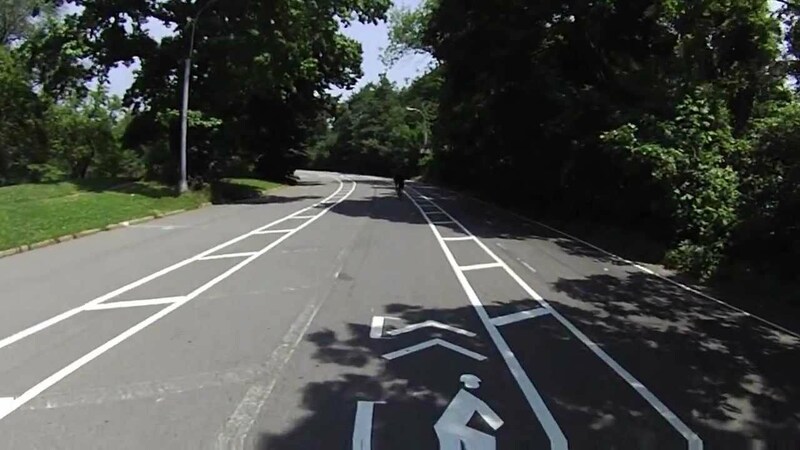 Grossly inadequate bike lanes. Some are so bumpy you’re likely to chip a tooth. You have to watch the road instead of what’s going on down the road, which is dangerous for everyone. Maintain the lanes. Cars. After one particularly close call, I opted for the longer, but safer route through the park. Build more bike lanes and build them in a way that protects pedestrians, bikers, and motorists. Inconsiderate and unsafe biking. Of course, it’s #NotAllBikers, but there are some terrible bikers, just as there are terrible motorists. As a percentage, I see more of the former than the latter. There should be more education about safe biking practices, and how to share the road, especially on bridges. Cops crack down on bikers instead of unsafe biking. I’m convinced the city hasn’t adequately figured out how to police the quickly growing number of bikers. Bikes are similar to cars in certain ways, but very different from cars in other ways. Treating them as equivalent is unsafe for everyone. Cops who police biking should probably be on bikes themselves and not in cars. I think this would give the officers better insight about safe and unsafe practices, infrastructure problems, and so on. All that being said, if I could only give one bit of policing advice to NYPD, it would not be about biking. Admittedly, I miss reading on the train. But the extra exercise, contact with the morning air, and sense of freedom that comes with a bike all make a wonderful substitute. 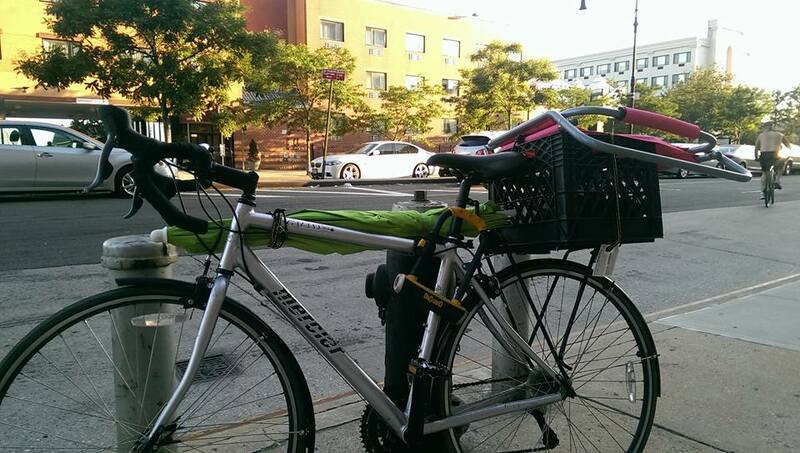 This entry was posted in Uncategorized and tagged biking. Bookmark the permalink.